If you are considering fly fishing Alaska for trout then here are the reasons why you should fish with us. The Copper River Lodge only takes 6 guests a week! I do not know of any lodge in Alaska that has this capacity. You will know our crew more as friends than crew by the end of the week. This ensures that we will know your fishing goals, and abilities. The Copper River Lodge is the only lodge on the world famous Copper River itself. You can walk right down to the river from our lodge and be fishing. While there are other lodges in the area, other lodges have to boat 5-15 minutes to get to the river, and it is impossible to fish in front of the lodge. The Copper River is one of the best trout rivers in Alaska. It is a fly fishing only river. It is easily waded and crossed. Guests can spread out and fish every inch of the river. Dry fly fishing! 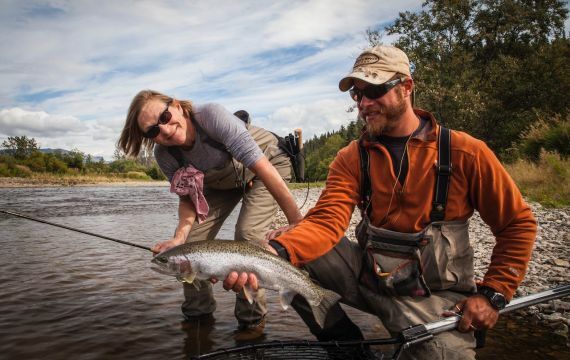 The Copper River has some of the best dry fly fishing in Alaska in June and July. It is lower 48 style trout fishing for Alaska sized trout. We also have amazing Sockeye salmon fishing in July. The Copper River rarely blows out. Over 80% of the water coming down the Copper comes from a lake. Any river can blow out, if the Copper does blow out it recovers very quickly ( the river itself is only 22 miles long). Our guides are the best our guests have fished with. This is still the most common comment our guest’s leave on our critiques. They are very knowledgeable, but not over confident. Our guide’s know this river better than any other lodge. We fish it every day for 4 months every summer, and most of our guides have guided with us for years. The Copper River Lodge holds the only permit to trespass and fish the Copper River. This allows us to legally access the uplands of this river. At any other lodge chances are if you step on the grass you are trespassing. This also allows us to leave jet boats on the upper Copper and access water that very few people fish. We can also legally step on the bank and spot fish for you. We rebuilt the lodge in 2014. Guests now stay in private cabins with bath and shower, and their own deck looking over the river. Our lodge is also new with a great deck to have a drink, and watch the sunset. We have a lake boat to access other tributaries that flow into Lake Iliamna. Our favorite other river to fish is the Gibraltor river. We can reach the Gibraltor in about 40 minutes. You can also fly out to the upper Copper River and raft down to the lodge. We only charge you what the air taxi charges us. This fly out can be as little as $150 per person for the day! If you can get an opening, you might just want to come back every year. Over 90% of our clients are repeat clients or were referred to us by our clients and we book up every year. We are happy to give a reference of guests that have fished the exact week you are considering. Come see why we have had one of the best fly fishing for trout lodge’s in Alaska for nearly 40 years! Joe Hyde, our on-site manager, has 12 plus years of experience and like the Royal Coachman Lodge we have the most experienced guide staff in the area. Fishing was spectacular in 2018 and like last year, there was a big population of healthy rainbows in the river. This was a great year weather wise. We had good weather with just the right amount of rain to keep water temps down. The fish were healthy and fat all season. June and July as always provided great dry fly fishing. A huge sockeye run in July led to an outstanding August and September fishing. We had a fantastic salmon run this year, but more importantly it was drawn out. We had spawning fish from the beginning of August until mid September. That is a long time for a trout to sit at the buffet table. They were looking fairly obese when we left in late September. 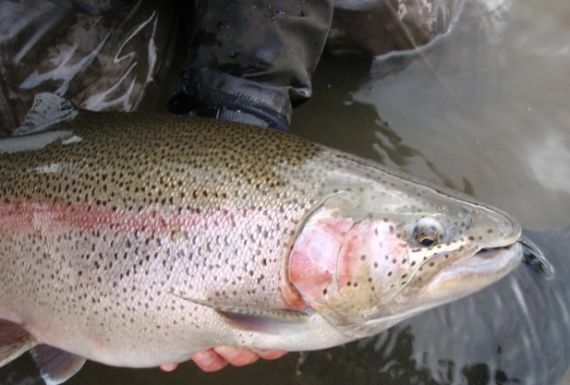 We expect many of the 20-23 inch rainbows to be in the 22-25 inch range for next year. With such a long history, experienced crew and great fishing, we have many returning guests each year. Over 90% of our guest have fished with us before or have been referred by one of our guests. 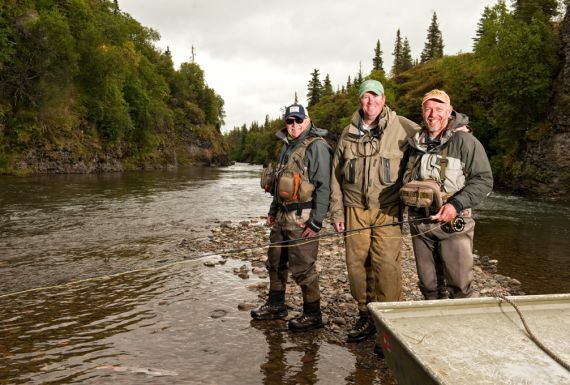 Our small size, just 6 anglers per week, and an intimate setting insure that our guests receive the best service and Alaskan experience possible in the Iliamna region. After such a successful 2018 season (100% booked), we are almost booked for 2019. All indicators point to another great year. We still have prime openings available, but with our smaller size, they fill faster than most lodges. Don’t wait to contact us if you’re interested in fishing Alaska next summer. Come to one of Sweetwater’s Alaskan lodges and find out why anglers from around the world come to fish with us. At our lodges you’ll always receive attentive and friendly customer service, great food, comfortable accommodations and superb fishing. Call us or email us, and we can tell you why our lodge is one of the best in the business. But if you do not believe us, talk to one of our past clients, they are our best salesmen! "Your lodge provided me and my son one of the best experiences of our lives, which we will never forget. Thanks." Help us protect one of the last great salmon runs in the world by donating to Trout Unlimited's Sportsman's Match campaign. Right now until the end of the year, all of the donations are being matched by an anonymous donor and the Copper River Lodge. ►Trout Unlimited’s efforts to stop the Pebble Mine. Save Bristol Bay and Stop the Pebble Mine! Email Pat at pat@sweetwatertravel.com to have your TU donation quadrupled!